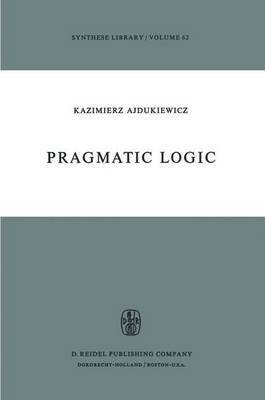 When asked in 1962 on what he was working Kazimierz Ajdukiewicz replied: Several years ago Polish Scientific Publishers suggested that I pre- pare a new edition of The Logical Foundations of Teaching, which I wrote 1 before 1939 as a contribution to The Encyclopaedia of Education. It was a small booklet covering elementary information about logical semantics and scientific methodology, information which in my opinion was necessary as a foundation of teaching and as an element of the education of any teacher. When I recently set to preparing the new edition, I rewrote practically everything, and a booklet of some 100 pages swelled into a bulky volume almost five times bigger. The issues have remained practically the same, but they are now analysed much more thoroughly and the threshold of difficulty is much higher now. The main stress has been laid on the methods used in the empirical sciences, and within that field, on the theory of measurement and the methods of statistical inference. I am now working on the last chapter of the book, concerned with explanation procedures and theory construction in the empirical sciences. When that book, which I intend to entitle Pragmatic Logic, is com- pleted I intend to prepare for the press Vol. 2 of my minor writings, 2 Language and Cognition, which will cover some of my post-war pa- pers.